Wednesday July 27th 1898 We did ironing this morning and I cut out four shirts for Will. The boys got home from Harts at noon. They began on our oats in the afternoon. Will was over to Hill Siding. It looked very much like rain at night. Thursday July 28th 1898 We did an awful lot of work in the forenoon and I sewed and practiced in the afternoon. They made a big start on our stacking. It was late when we had supper. Friday July 29th 1898 We were busy most of the forenoon with the work. I sewed and practiced in the afternoon. Will did not feel able to work. The boys were driven in from their work at five oclock by a steady rain. I read and wrote in the evening. Will felt better at night. 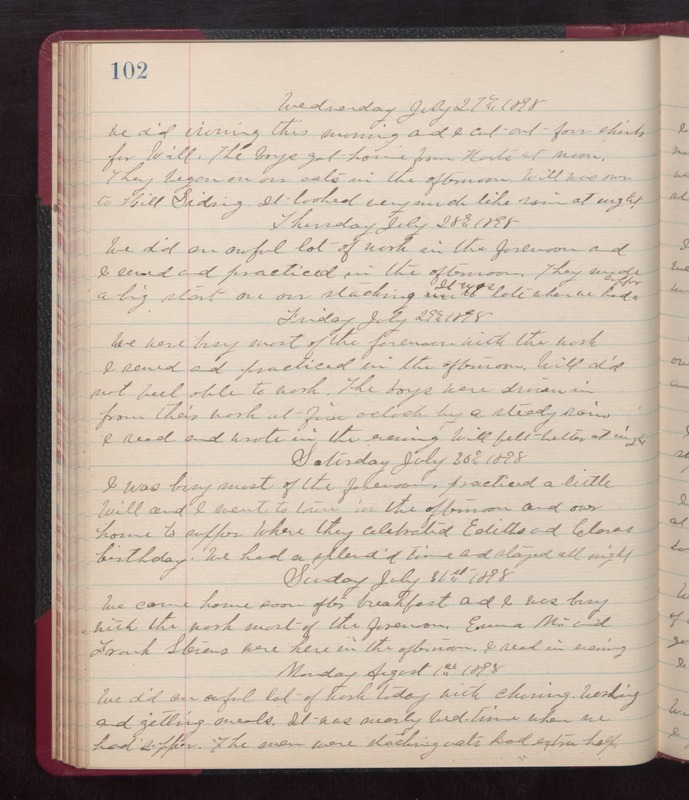 Saturday July 30th 1898 I was busy most of the forenoon, practiced a little. Will and I went to town in the afternoon and over home to supper where they celebrated Ediths & Claras birthday. We had a splendid time and stayed all night. Sunday July 31st 1898 We came home soon after breakfast and I was busy with the work most of the forenoon. Emma Mc-- and Frank Stevens were here in the afternoon. I read in evening. Monday August 1st 1898 We did an awful lot of work today with churning, washing and getting meals. It was nearly bed-time when we had supper. The men were stacking oats had extra help.